Thank you for great products and service. Great product, great service! Have made several batches of ferments and highly recommend these jars. Easy to use, just starting out fermenting vegetables and it worked first time. Great jars, easy to set up and use. Great fermenting system. Already buying another as a gift. Lid is interchangeable with any large lid Weck jar. Great set for small quantities (although, you can get almost 1 1/2 cabbages in here once crushed). Product is a little fragile and I broke one by sitting it down on a table with the weight lid inside. A simple movement and the bottom fell out of the jar. Just be careful! Excellent fermenting kit great for the beginer or the expert highly recommended! Great product, packaged well, quick delivery, thank you. Great product and fast delivery, used it the first day! Preserve your food the natural way with the Weck Fermenting Jar. Fermenting food is the oldest form of preserving with the technique being in use for over 4000 years! Yes you can make Pickles, Kimchi and Sauerkraut, and that is just the start. Ferment all your veggies and fruits into delicious foods which are much better for your health! Weck Jars are made with thick glass. Glass lids preclude issues with rusting. All jars have wide openings for tidy, easy filling. The Weck lid effectively provides an airlock, allowing gases to vent naturally from your jar without your intervention, which can introduce harmful yeasts or excessive oxygen to the fermenting product. The lid will fit any Weck large mouth jar. You will receive the lid with plasic airlock, a rubber seal, 2 clamps and the 1.5 litre cylinder jar. 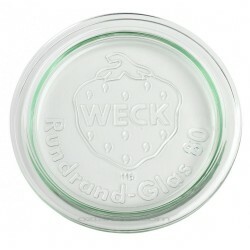 Please note that you must use Weck Jars with the Weck fermenting lid. As an optional upgrade, you can purchase the Sterilock waterless airlock with an optional odour absorbing capsule (which must be used with the Sterilock waterless airlock). More information about the Sterilock airlocks can be seen here. If you wish to purchase a dunking weight, the small size is suited to this jar. Now when your bounty is fermented, all you do is remove the Weck fermenting lid, and seal your jar with a BPA free regular glass or plastic lid canning lid. Please note that some burring of the glass can occur but this does not affect the seal or the food inside. Please take care when inserting or removing the airlock to do so gently and hold the black grommet in position whilst doing so. Check that the seal is seated on the lip on the underside of the lid. Insert the airlock into the rubber hole on the lid, being careful not to push too hard. Place the lid with the airlock inserted on top of the jar and clip on the stainless steel clamps. Once the product is fermented, you can store it in the fridge with the air lock in situ, or remove the lid and replace with a storage lid such as the Keep Fresh lid. Note that this model differs to our previous 1 litre fermenting jar which took a medium lid. The We..
1 x 50ml Weck Mini Tapered Jar 755 - choice of jar only or jar complete with glass lid, rubber seal..
1 x 200ml Weck Tapered Jars - 751 - jar only or choose to include glass lid, rubber seal and 2 stain..
Lid Glass Suit Weck Preserving Company (Germany) Food Preserving Jars - LargeWeck reusable Glass..
Lid Glass Suit Weck Preserving Company (Germany) Food Preserving Jars - MediumWeck reusable Glas..